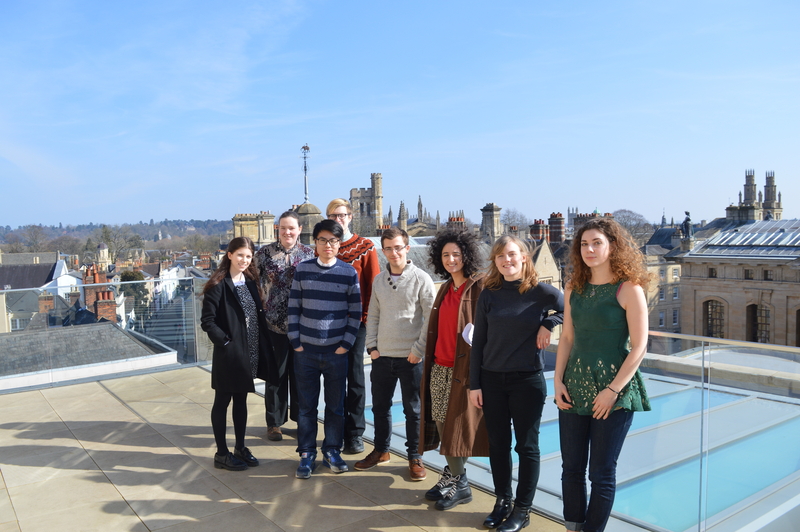 On 14 and 15 March eight Oxford University students took part in a web archiving micro-internship at the Weston Library’s Centre for Digital Scholarship. Working with the UK Legal Deposit Web Archive, they contributed to the curation of a special collection of websites on the UK European Referendum. This is the first of two guest blog posts on the micro-internship. During a micro-internship at the Bodleian’s legal deposit web archives, focusing on the EU referendum collection, we have had an occasion to reflect on the meaning of such an archive, and particularly on its potential for creating meaning. Web archiving micro-interns on the roof of the Weston Library, March 2016. A web archive’s potential document base is clearly much wider than a paper collection’s. No material criteria, such as donations and physical availability, play a defining factor in the content archived. The main restriction placed on this particular archive is that of legal permission, which allows only UK domains to be easily archived. Even so, the scope remains incredibly wide. Therefore, archiving the web implies a deliberate narrowing of choices on the archivist’s side. Much is left to their discretion. A lot of what we know of history is defined by the material that is preserved. It is difficult to learn about the working class or women in the past from original sources, as material by and about such people is conspicuously absent from our collections. A contemporary web archivist has the chance to select material that can most broadly represent society. This will make it impossible for future historians to ignore the history of many groups, and will enable research into a variety of thoughts and experiences. This was reflected and magnified in the approaches that the group of interns took, which evidences the importance of having a range of different people cooperate on the gathering of knowledge. One woman, for example, concentrated on the representation of the Brexit referendum in media specific to certain ethnic and religious groups, such as Judaism. Another made sure to include the views of Scottish, Gaelic and Irish media and organisations, in order to avoid an England-only approach. One of the interns chose to gather information about the way the referendum is seen in small communities, enriching the archive with small local publications. On the first day, I concentrated on the views and representation of immigrants, whose lives will be strongly affected by the referendum. On the second day, I preserved information about women’s roles and views. Such a wide range of approaches contributes to the broadening and deepening of historical studies. It also positively contributes to contemporary social science. This can happen in two main ways. Firstly, it places virtual documents in a setting that makes their analysis easier. It thus enables social scientists to observe internet trends throughout the years, and compare them to each other. For this purpose, a wide range of archived material is essential, and again the archivist has a role in creating the foundational understanding of British society..
Secondly, and perhaps more interestingly (as the first function can be fulfilled by tools on the live web) they allow social scientists to track trends in academia. A web archive describes what subjects and focuses contemporary academia considers to be salient. It points out what we, as researchers, think is worth being saved from the internet black hole. The defining potential of this is striking, and this internship allowed us to understand the social, political and historical role of archiving.